A total of 277 illegal Fintech companies were dealt with by their activities being stopped by the Investment Alert Task Force team. In addition, the Investment Alert Task Force team also took the Ministry of Communication and Information to have their applications removed. 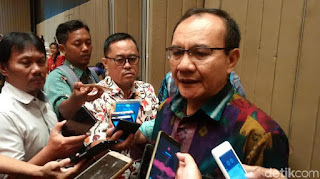 This was revealed by the Head of the Investment Alert Task Force, Tongam L Tobing after the Financial Services Sector Crime Socialization and Investment Alert Task Force at the Po Hotel Semarang. Actually, Fintech is supported because it facilitates banking access for people who need funds. "Fintech is encouraged to provide financial access that cannot be handled by banks. But in the field, many Fintech companies are not registered," Tongam said on Friday (08/24/2018). There are 277 Fintech companies that have been summoned by the Investment Alert Task Force. They violated OJK regulation number 77 in 2016 because they were not licensed. "On July 25 we called 227 illegal Fintech. We asked them 4 things, the first one they had to register with OJK," he said. Secondly, continued Tongam, 227 illegal Fintech was asked to stop activities while not registering. Third, they must delete applications for smartphones or on websites and social media. Finally, they were asked to complete their responsibilities to Fintech users. "We also ask the Ministry of Communication and Information to delete and block the website. We also call Google Indonesia to remove the platform on the playstore," he explained. Some complaints were heard from a number of Fintech users such as interest rates that were too high as 1 percent per day even though the loans were short-term. "So if you borrow Fintech because it is easy to not meet those who have funds, then it is appropriate to pay for the ability to avoid bad credit," Tongam concluded.